*Both our U14’s and U10.5’s reached finals on Saturday with differing outcomes. Our U14’s had a bye in the league and so took the opportunity to compete at the Attical 7’s tournament. Having negotiated a tough group they progressed to the final of the Ray Haughian Memorial Plate. Leading by nine points at the turnaround the Fin put in a virtuso second half display to beat Dundrum 4-11 to 1-6. 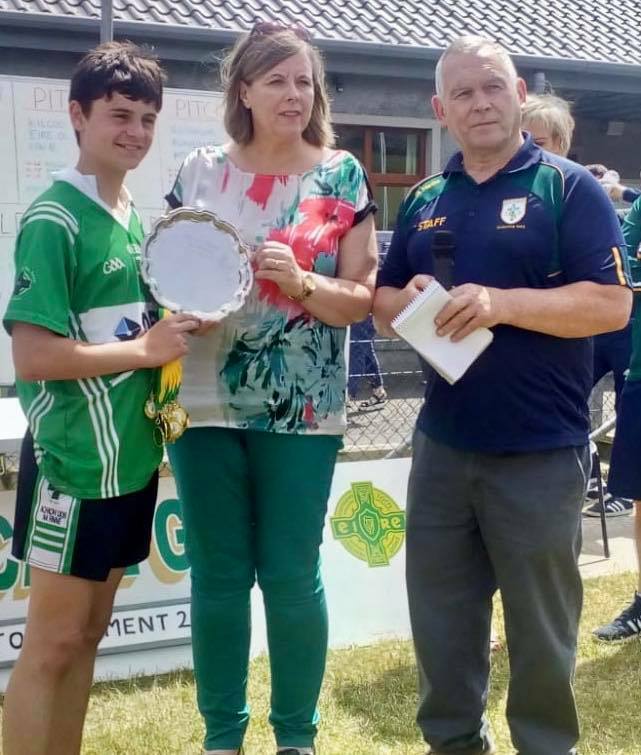 Well done all our players and mentors on their success and also to our captain Conor Walsh who was shortlisted for player of the tournament as well. Team: O Maguire, K McComiskey, J King, C McCann, R Tweedie, N Dornan, C Walsh, J Steen, M Flanagan, R McCann. 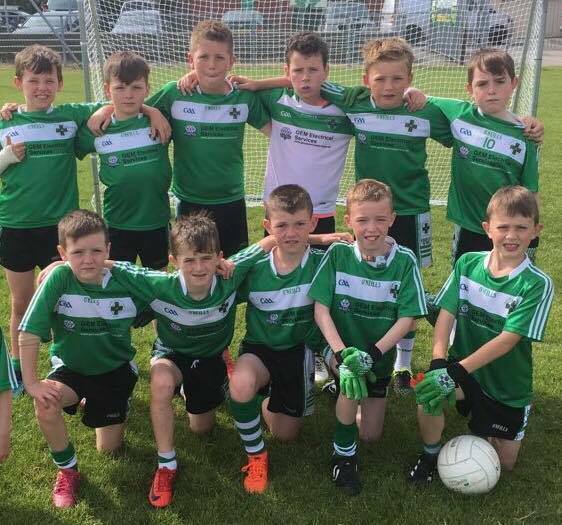 Our U10.5’s, however fell short by a kick off the ball losing out to parish neighbours Castlewellan. 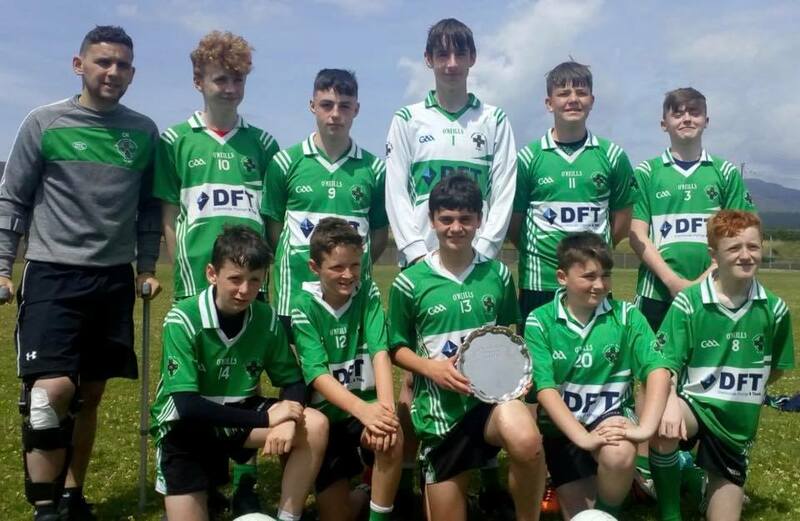 Having finished runners up in their group the Fin progressed to the semi final of the Shield competition where they defeated Kilcoo by a point in a thrilling game. Last season Kilcoo got the better of the Fin in the U8.5 Cup semi final. In the final the Fin led the Town by four points before the Town won out on a 4-1 to 3-1 scoreline. A great effort from the lads who continue to improve week by week. Team: D Steen, J Lenaghan, R Quinn, R Croskery, O Murray, C O’Hare, C Flanagan, D Steele, D Brennan, M Murphy, B Clarke, D Steen. Thanks to Bryansford for hosting and to the East Down Board for a superbly run competition. *Our U16’s did however manage to win against Castlewellan in the latest East Down league game. Having defeated the Town by 15 points earlier in the season this game was a lot closer with only five points separating the sides at the finish. The Fin were missing several key players but did well to lead 3-3 to 0-8 at the interval. A stronger second half showing from the Town but they fell short in the end. Final score Aughlisnafin 5-5 Castlewellan 1-12. Aughlisnafin: R Morgan, A Quinn, C Steen, D Murphy, P O’Hare, E Lyttle, C Walsh (1-0), R Walsh, A Flanagan (1-1), R Clarke (0-1), M Croskery (1-1), O O’Connor, O O’Neill, D Lavery (0-2), C Donnelly (2-0); Subs: E Murray, N Dornan, O Maguire. Next game is away to Saul. *Our U12’s met Bright on Sunday in a re-fixed game. The game was played over four quarters due to the extremely hot conditions on the advice of match referee Gavin Corrigan. With three players missing from the original fixture the Fin did well to lead 1-2 to 0-4 at the end of the first quarter. By half time Bright led 3-5 to 1-02. With the bulk of the Fin team involved in reaching an u14 final and an u10.5 final the previous day Bright outscored us 2-2 to 1-3 over the last two quarters to win the game. Final score Aughlisnafin 2-5 Bright 5-7. Aughlisnafin: S Croskery, R Quinn, R Croskery, D Steen, O Murray, C O’Hare, C Flanagan (0-1), J Steen (0-1), M Flanagan (1-3), R McCann (1-0), J Lenaghan Sub: S Boden Hall. *Baile and Locha minors remain third in the league table after another excellent win last Tuesday evening. There was no more than three points separating the sides for the most part of the game before a strong final quarter from the Loch got them over the line. Final score Bryansford 1-12 Ballylough 3-20. The Loch were due to play Bredagh next but with the Cherryvale side unable to fulfil the fixture the next game will be away to Kilcoo next Tuesday. *The seniors game against St Michaels was postponed until 24th July and the next game is away to St Pauls next Friday 6th July at 7.30 pm. *The Kellogs Cúl Camp will be held at Pairc Baile Anna Monday 16th to Friday 20th July. It can now been booked online. The Nursery Camp must be booked direct with the club. See our club website of social media for details. *Very well done to our underage members Claire and Genevieve Lenaghan who competed in the Irish Nationals at the Citywest in Dublin at the weekend. Genevieve was placed 24th in the Priomh Comortas in the solos and also joint eighth place out of 32 in the team dancing. Both girls are members of Brennan Miskelly McCormick School of Irish Dancing. *Lotto 3,12,23,26. No Winners. Jackpot £3,475.